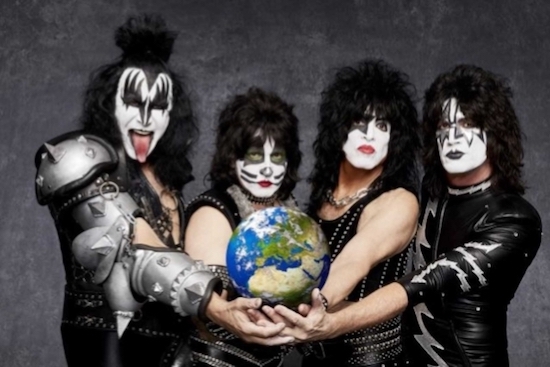 After a 45-year career, KISS announced they will embark on their final word tour, during their appearance on NBC’s America’s Got Talent on Wednesday. Ed makes these categorical statements about bands staying around too long when really everything has conditions and staying around too long is a hypothetical imperative. Shannon, I love ya bro, but sometimes you really Shock Me. Weren’t you just complaining a couple of years ago about Judas Priest staying around too long? Remember “Redeemer Of Souls?” You were talking about how upset you were because they changed their mind about retiring, and how Rob’s voice wasn’t the same, Rob’s voice? Have you heard Paul’s voice lately? It’s completely shot! It’s so bad now that he has to lip sync, talk about phoning it in! Anyway, I guess my point is, why were you so upset about JP not retiring years ago, but not KISS? To each their own, but I want to remember KISS the way they were, or at least close to it. Of course JP has changed alot over the years as well, but at least Halford doesn’t have to lip sync, …yet! And hopefully never will. So what gives? …and I definitely don’t want to see the once great Paul Stanley turn into Milli Vanilli! (Eye roll) LOL!!! Well Doug R., I just hold Priest to a different standard because their faultless execution is so vital to their music; it affects the music differently than Kiss. But really, I have just been through too much with Kiss to hold it against Paul and Gene and really, I wouldn’t expect anything less than those guys having to be dragged off the stage and it’s funny that everyone is so surprised by it. I tell ya, Doug, I have really gotten a deep appreciation for Sammy recently and he is the perfect example of what’s lacking in rock stars of the last 20 years if you can even call them that. Sammy was truly great and deceptively great because he had such an “everyman” thing going for him but by being so down to earth he allowed us to experience greatness with him and that is what being great and being an artist is really all about. What that guy has is scarce in the world of artists man. Doug, Sammy is a conduit where an ordinary schlub like me can experience greatness; that what great artists did and that’s all gone now but Sammy did that better than anybody. What is going to be more laughable? Ticket prrices for this tour? Paul Stalnley’s voice for 3 years ? I saw them when I was a teenager on all their tours, some were good, some were not. I saw the reunion tour and that’s what I had been waiting for. Then Peter left, then Ace, then I lost interest. I don’t want to see them with Tommy and Eric wearing Ace and Peter’s make-up, doesn’t matter that it’s their final tour. I don’t have a readon to go see them one final time. I saw Sabbath’s final tour, I saw Rush’s final tour. Kiss, have been going downhill, especially Paul’s voice and I don’t want to hear him weakly croaking out songs that he used to belt out strongly. But it would also be nice to have one final opportunity to secure a good seat close enough for Gene to see me flip him off one last time. Huh, now that I think about it, maybe there is a reason for me to go see them one last time. Stop bickering you clowns and head back to Staten Island. This was a great band with an interesting history and they will be missed. Let’s all just hope that Gene Simmons does not get back into acting. Have you ever seen the film RUNAWAY with Tom Selleck and Gene? It was possibly worse than KISS MEETS THE PHANTOM OF THE PARK minus the camp aspect. Maybe Peter and Ace can tour with Eddie Vedder as the starchild and Wolfgang Van Halen as the demon. Mix it up a little. There will never be another KISS. Those 4 guys are like a father to me. Hey, Monet, who’s bickering? Where just having a conversation, chill, bro! Jeez! And you don’t have to sell me on KISS, I’ve been supporting (literally) the band from the beginning! In 45 years, my only issue with KISS is the same issue for the last 16-17 years, Tommy & Eric, and that’s it! Every other member of KISS was allowed to be themselves (with or without makeup) EXCEPT Tommy & Eric. Well, maybe 1 more issue, Paul’s voice! I know he wants to, but he just can’t sing anymore, it’s become embarrassing, and honestly I feel bad for him. I mean, I know he tries, but it just isn’t there anymore, hasn’t been for the last 10 years or so. Maybe they’ll finally play Charisma or She’s so European on this tour. “Charisma” would be cool! From UNMASKED – “Naked City!” Gene’s bass is just so in your face, (no pun intended) absolutely superb!